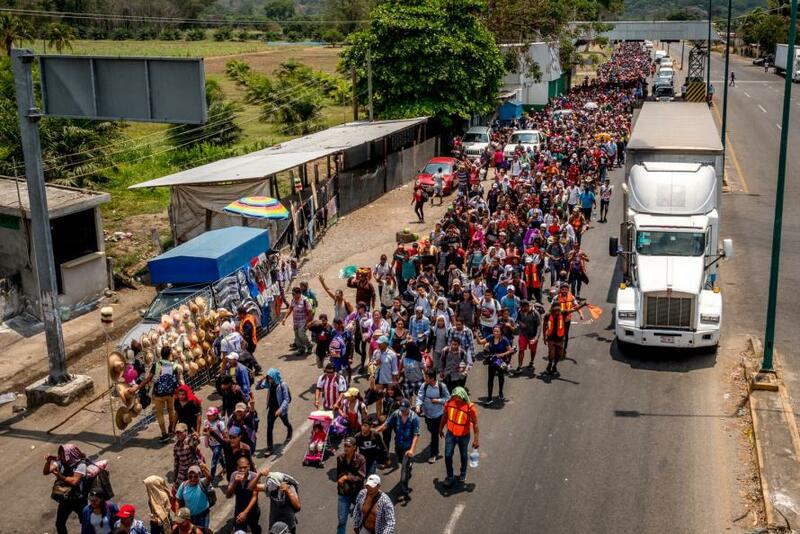 Trump Rages: "Use Nuclear Option To Stop Massive Inflow Of Drugs And People"
For the second time in two days, Trump took to twitter to warn about the caravan of migrants headed through Mexico to the the US border, and bashed the Mexican government for allowing migrants untrammeled access to its northern border and Democrats for passing laws that "don't do their job." In doing, the president demonstrated that he's not only listening to his right-wing critics - of which Anne Coulter the most prominent example - who chastised him as a "lazy ignoramous" and levied charges that "all he wants is for Goldman to like him" - but is clearly worried about the midterms and a potential impeachment should Dems win the House and Senate. It also seems that the recently emboldened President is at least trying to give the impression of putting his foot down when it comes to his promised border wall (even if he failed to obtain the funding needed to build it) with demands that Congress pass a comprehensive border-security package and lift certain restrictions on ICE agents. ...Congress must immediately pass Border Legislation, use Nuclear Option if necessary, to stop the massive inflow of Drugs and People. Border Patrol Agents (and ICE) are GREAT, but the weak Dem laws don’t allow them to do their job. Act now Congress, our country is being stolen! Trump then reverted to his charge that DACA is officially dead, and it's the Democrats fault, a claim he first made on Sunday. Still, the president appeared to leave open the possibility of a deal, saying Democrats "must build Wall and secure our borders with proper Border legislation. Democrats want No Borders, hence drugs and crime!" DACA is dead because the Democrats didn’t care or act, and now everyone wants to get onto the DACA bandwagon... No longer works. Must build Wall and secure our borders with proper Border legislation. Democrats want No Borders, hence drugs and crime! Yesterday, Trump demanded Senate Majority Leader Mitch McConnell to invoke "the nuclear option" - modifying rules to require only a simple majority to end debate and move to a vote, effectively killing the opposition's ability to filibuster. Democrats, who made this change for presidential appointments back in 2013, have said they regret it (it allowed Trump to appoint Neil Gorsuch). Of course, what Trump isn't saying is just as problematic as whipping up votes from Democrats. Many Republicans are wary of Trump's lavish border-enforcement promises, and are worried that, between the infrastructure bill, tax reform and the omnibus spending bill - Trump is trying to do to the US what he did to the Trump Organization in the 1990s.